Bachelor Thesis from the year 2006 in the subject Business economics - Business Management, Corporate Governance, grade: 1,0, Leipzig University of Applied Sciences, 35 entries in the bibliography, language: English, abstract: "Once, Disney's CEO Michael Eisner commented the entertainment business with these words: „Fantasy is very hard work. To make something fun, is hard. It's gratifying. It's satisfying. But fun? No." ...[...]" This thesis occupies on location decisions for Foreign Direct Investment and its particular impact on regional structures. Against the background of the entertainment industry and regarding the specific case of Euro Disney, expectations and reasons for locating an economic activity as well as the examination of the effect for the region are pointed out. 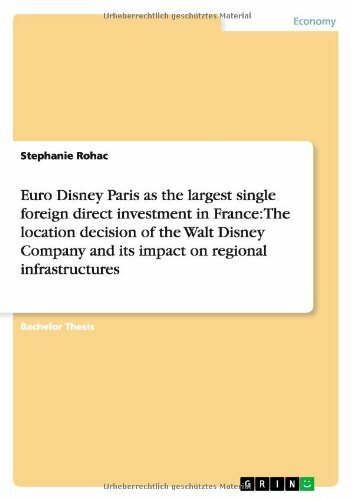 In particular, the focus goes to the analysis of the location decision made by The Walt Disney Company and its impact on regional infrastructures. Aim is to show how an individual incentive package and especially the provision of key infrastructure can influence the location decision of potential investors particular in business with high infrastructural awareness. Further, the case of Marne-la-Vallée is an excellent example for an observation how Foreign Direct Investment can help to advance regional development. Especially caused by the specific characteristics of the theme parks and resort business, the focus to the location decision in particular view to the infrastructural development seems to be interesting. Nevertheless, the successful operation of a theme park highly depends on the location and infrastructural network connecting the site in all directions. This thesis may be interesting for regions willing to attract investors and for potential investors as well. Certain businesses such as the theme park and resort one are highly dependent on excellent infrastructural connection, besides all fiscal and financial incentives, infrastructure often is presumed as self-evident.